A solo exhibition, an art thief, and no sleep. As promised, I’m finally having a moment to write down the events related to my show for you to read. The Pavilion I gallery solo exhibition was my largest show to date and final tally was 80 paintings! And I was worried about hitting 40 when I first accepted, funny right? Setting up was a real roller coaster of emotions. First obstacle was finishing a couple of large paintings that I wanted to get in for the show. But the catch on the large one was I using a new paint that I was not familiar with. Even after a month of sitting on the easel, the damn paint wasn’t drying. Not even close! It felt as wet as the day I laid it on the canvas. Framing was also stressful, thanks to a snow storm and a cold freeze that prevented the snow and ice from melting away. That meant that FEDEX delayed my delivery by several days. After three days of framing and staying up late with only two or three hours of sleep. 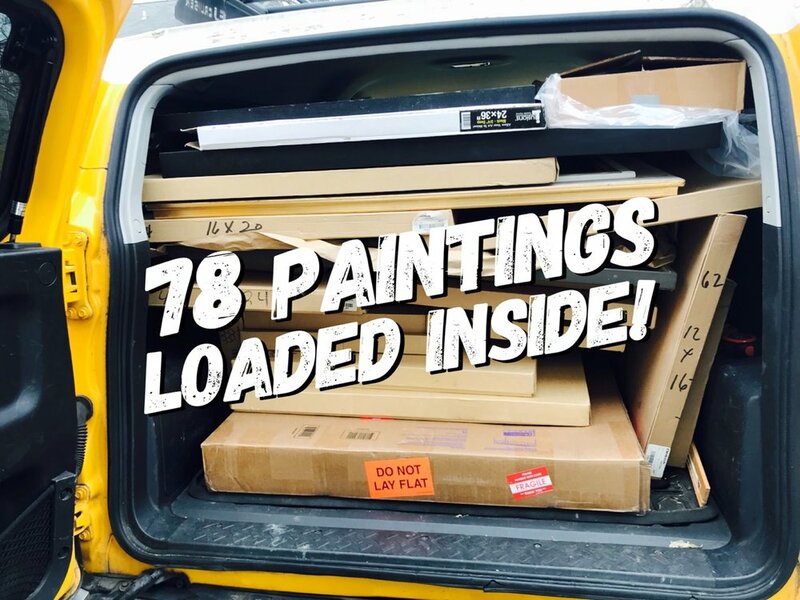 Finally I get done and load up 78 (which really turns out to be 79 because I forgot one) into the truck. Can you say stressed out? Here I am with a truck loaded up, going down the freeway praying I don’t get hit by another car! Spending most of the day loading and unloading my truck and placing paintings across 6 floors, I finally left to go home. I would later discover I had 79 paintings inside. Whoops! Just the first floor wall! Five more floors above. The next day I get a text from the gallery coordinator and she is asking if I have removed a painting. I text back “NOPE” and then called her. “Slave I” from the 31 day challenge last year was swiped right off the wall after it was hung an hour early! My immediate thoughts are that this has to be a StarWars Uber fan as the painting didn’t even have a title card posted yet! After a few minutes of thought I decided to post on FB. I mean, what the hell do I have to loose? Right? What happens is an immediate avalanche of shares on FB to my amazement. Friends have even shared on StarWars fan sites and message boards. Thursday comes and I am in need of a painting to replace the stolen one. I’m still pissed about the stolen painting. Then an idea hits me as I’m talking to my friend Sam and that night after everything else is done, I begin painting Boba Fett. 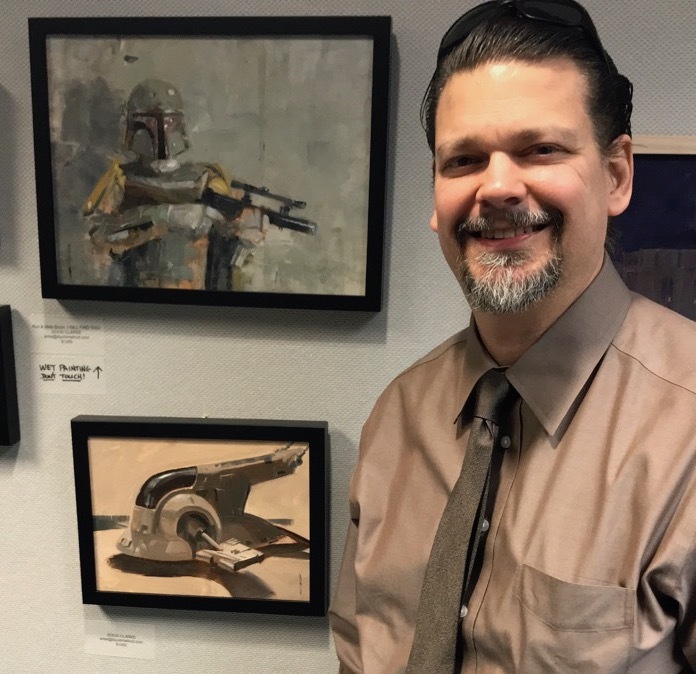 If you’re a fan of StarWars, you know that replacing a painting of Boba Fett’s "Slave I” with a painting of Boba Fett is significant. After all, Fett is a bounty hunter in the movies. Staying up till 4am to finish, I got to sign and titled the painting “Run & Hide Scum, I WILL FIND YOU!”. A clear message to the thief in the case he frequents the building. Next morning, I have to run and buy a frame for the new Fett painting. Then go attach labels to the work hanging at the gallery. Seventy-nine labels across six floors is a lot of work. "Run & Hide Scum, I WILL FIND YOU!" Somewhere in between that, I get a call from somebody who says their employee has my painting. He asked where I am and said that he will have the thief deliver the painting back to me. I told him that I was at the place where the painting was stolen at. He says good and the thief will be there in 20 minutes. Let me tell you it was a long 20 minutes! All I could think about was making sure I didn’t miss him walking in. Luckily the building superintendent showed up minutes before the thief did. As the culprit walked in, he tried to bolt for the elevators before I stopped him and told him to turn around. I pulled my camera out and shot photos of him directly holding my painting. 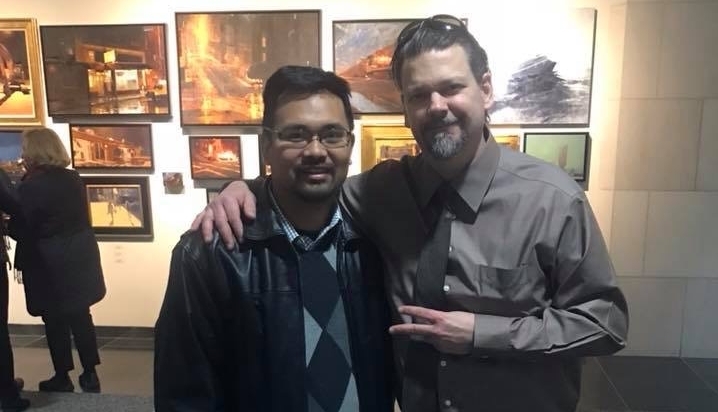 There he was, standing with the stolen painting, the guy that had called caused me so much stress the past few days. I asked him why he stole it. I asked him why he didn’t contact me with the website address printed on the back. I told him if he wanted the paining so bad, I would’ve gladly worked out a payment plan for him so that he could own it. He just said that he was sorry and he made a mistake. He said he knew it was wrong the minute he stole it. I asked him “If you knew it was a mistake why didn’t you reach back out to me and tell me so?”. I told him I didn’t think he was that sorry because he waited until he was caught. I proceeded to chew him out and then demanded that he go upstairs and look at the replacement painting. 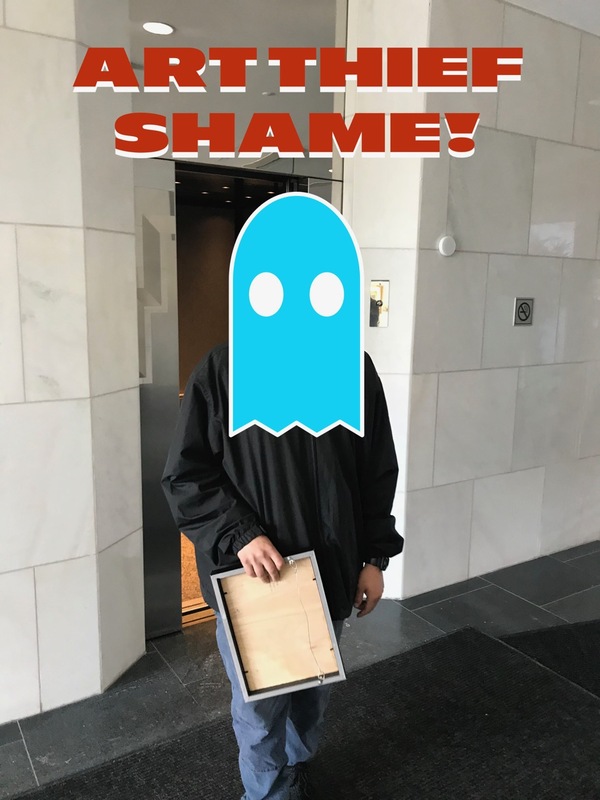 As we were in the elevator I asked if he thought his parents would be ashamed if they knew what he had done. He replied, “Yes”. I asked him how old he was and he said, “23”. Then I asked him, “You do know this was a felony right?”. He looked down and sighed. We got to the floor and I made him walk up to the paining and look at it. There was Boba Fett hanging on the wall. I then told him to look at the title of the painting there on the small label and read the following “Run & Hide Scum, I WILL FIND YOU!” title. The thief‘s head dropped down. His face turned sour like someone who’s just been punk’d on TV. I told him I thought he would be back and painted this just for him in case he just happened by again. After some more of me chewing him out, I told him to leave and sort the rest of his day out. I would later learn that he was fired after returning to work. After finally getting all of my labels done and deciding to hang the returned stolen painting below the replacement, I headed home to shower and change for the show. Boba Fett gets his revenge! The evening came and managed to return back just in time for the exhibition to start. 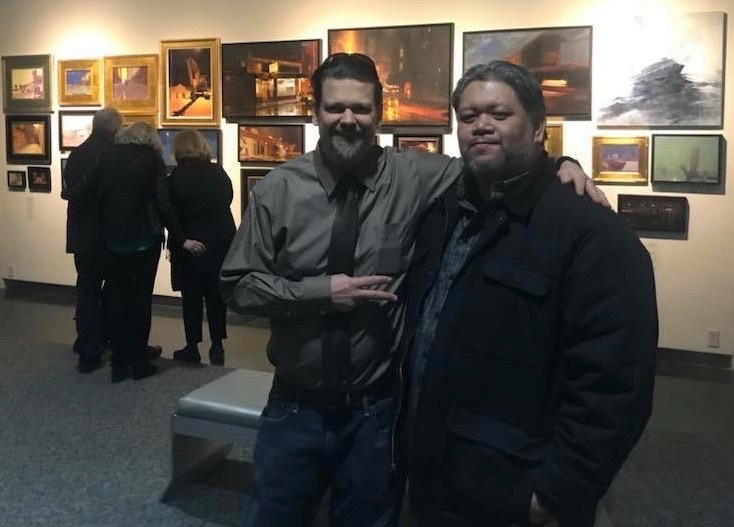 After everything was said and done the opening reception was a blast. I did my best to try and talk to everyone and manage sales of paintings. Best of all, was knowing I had made it through the week and I could relax for a day. She is checking out the 79th painting I forgot to count! Sunday I remembered that I needed all new work for my next solo exhibition in mid March. I’m writing this now as I know it will be awhile before I surface and come back up for air to post another blog. Now back to the easel with my largest painting to date finished and drying with many more left to paint! Even the local paper got involved with the story! Nobody steals Boba Fett's ship and gets away with it!